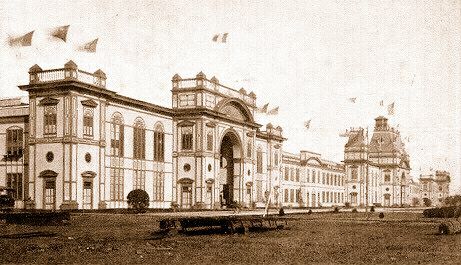 The French Building was situated on the south side of the Avenue of Nations, next to the Italian Building, and faced the Pacific Southwest Exposition's main court. 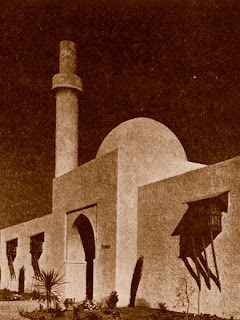 The building was of Tunisian-style architecture, and featured a slender minaret, grilled windows, and a dome-topped entrance portal. The interior contained numerous artworks, textiles, tapestries, furniture, and the original Coach of State, used by Napoleon Bonaparte. Plans were originally made for the Coach of State to tour the United States, to raise funds for a place of retreat for men who were severely maimed during the First World War. However, before the tour started, an anonymous American woman donated $200,000 to construct the facility for these "Men with the Broken Faces", and the historic coach was instead brought to Long Beach. After arriving at the exposition, the coach was dedicated by silent-film actress Renee Adoree, and placed in the French Building where it was admired by thousands of visitors.